Russian defector was poisoned here in November 2006. Description: It was here that in November 2006 former KGB agent Aleksander Litvinenko was allegedly poisoned. Not food poisoning but proper poisoning. 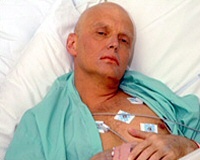 Alexander Litvinenko, a former colonel in the Russian secret service and a fierce critic of President Vladimir Putin, was rendered seriously ill and was placed under armed guard in hospital until his death. 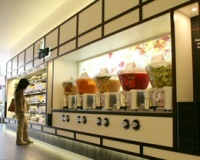 Mr Litvinenko, 50, who used to work for the Federal Security Bureau (the former KGB), fell ill after meeting a contact at Itsu, a Japanese restaurant in Piccadilly. The woman journalist claimed to have information on the murder of Anna Politkovskaya, 48, an outspoken journalist who was killed at her Moscow apartment last month. A close friend of Mr Litvinenko said: Alexander has no doubt that he was poisoned at the instigation of the Russian government. Mr Litvinenko has been living at a secret address in London with his wife and son because he feared he might be attacked by political opponents. The home of murdered Russian dissident Litvinenko.